I was dreaming of pizza. And my new favorite restaurant, Cheddar's. We were minutes away from heading out the door to the triage room, which considering the minute and a half apart contractions didn't really seem like the greatest idea in the universe, but hey, I was hungry and that was making the idea sound better and better by the minute. Sure I might end up having the baby in the car or on the sidewalk between the car and the house, but at least I would have (hopefully) gotten in a good meal first (because that's how quickly things pick up when I'm not laying down. I'd been cleared by the resident and it was time to go. Until... she reappeared with a new nurse and it wasn't time to go anymore (by the way, despite the hunger, logically I totally agree with the decision...). Someone had finally informed my own doctor that I had come in to labor and delivery and he vetoed the release and had me admitted. The next news was that the nurse who told me that I was actually GBS negative was wrong, and that not only am I not negative, but it's apparently a strain that's immune to every single antibiotic in the world (okay, slight exaggeration). But it's not resistant to vancomycin, which is apparently like "killing a bumble bee with a baseball bat" so at the moment I'm sitting on the birthing ball, in my new, very nice labor room, hooked up to an IV. The current baby weight estimate is right around 9 lbs. I just had a blogging break while I was hooked up to the monitor holding very, very still, while Patrick didn't cooperate with having his heart rate monitored. I'm unhooked again and about to take a nap. Hopefully I'll be able to sleep for a little while before things get too crazy. And of course, I have to show off one of my "quick the baby's coming" sewing projects. 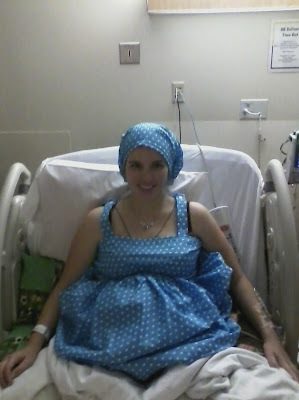 I made this hospital gown earlier in the month, complete with matching snood. It has snaps all the way up the back and at the shoulders. For some reason polka dots always cheer me up! Thanks to everyone for the prayers being sent up for us! I'm a little bit nervous at the moment and they're a great comfort! Before I go to bed, I'm offering a Hail Mary for you and Patrick! What a cute outfit! You are probably the best dressed woman giving birth right now :). I'm praying for you that everything goes well. Yay! I've been thinking of you and Patrick all day! Prayers for a happy & healthy labor & delivery! You look adorable in polka dots! Praying for you! You look so cute in your matching hospital gown and snood. I labored in my own clothes last time around and it just made me feel so much better than when I had to wear a hospital gown. So excited for you! Glad you're finally settled in. Prayers being said (still) for a safe and healthy delivery. I know they don't like this but...have you're husband sneak you in some food. They wouldn't let me eat and by the time all was said and done it took the nurses for.ev.er to give me a sandwich. It really helped that with the second labor the midwife kept forcing me to eat. Otherwise it's like your body's going through a major workout and you have nothing to fuel it with (iv stuff keeps you alive but doesn't really sustain you).